Not suggesting it's at all realistic for us, however, Millwall went on a heck of a run in the second half of last season and only just fell short. Seems that a lot of people on this thread are just basing their view of students on The Young Ones. 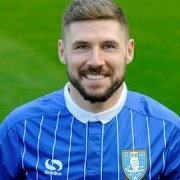 JJ tore us to pieces for Oldham in that early game at Hillsborough. 94/95: Most Boring Season Ever? I remember seeing fly posters for the Trev 'Back him or sack him?' campaign. "You got me Wanderley, Wednesday." What will the Chairman announce at the fans forum? I'm selling the club because you forced me to bring stripes back. Does anyone know any potential buyers? Teams wearing away kits when there's no colour clash. Grrr. Another idea - win some games. Is there a place for religion in football? Wednesday fans seemed happy to belt out 'God Save the Queen' at Swansea. I'm not really sure why. I was just about to say, remember 1990. This side is a million times worse than that one too.